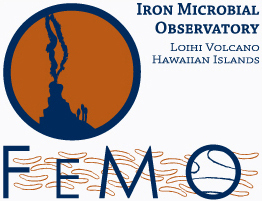 Welcome to the Fe-Oxidizing Microbial Observatory Project on Loihi Seamount. The importance of metals to life has long been appreciated. Iron (Fe) is the 4th most abundant element and the 2nd most abundant redox-active element in the Earth’s crust. The reduced (oxygen-poor) forms of iron contained in volcanic rocks and deep in the Earth therefore provide a rich source of energy for the growth of a very interesting group of rust-forming (iron-oxidizing) bacteria. Although research on microbial iron transformations has highlighted the importance of these processes, the majority of these studies have focused on the reductive Fe-cycle and low-pH living environments, which arguably do not represent the global ubiquity of iron-rich habitats. Loihi Seamount is a hydrothermally active seamount in the mid-Pacific ocean where waters containing high concentrations of reduced iron exit the Earth's crust and where massive amounts of volcanic rock come in contact with sea water. Here abundant iron-oxidizing bacteria, in the darkness of the deep sea, carpet the rock surfaces, forming rust coatings on massive areas of the seamount's surface. The bacteria form microbial mats and crusts on exposed rock surfaces and greatly accelerate the alteration of these rocks. In turn, the rust (iron oxide) impacts other microorganisms and affects elemental cycling on the planet. Processes such as these are probably widespread in deep dark environments where water circulates below the surface of land and the oceanic crust. 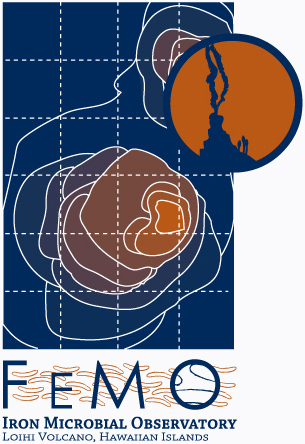 The focus of the Fe-Oxidizing Microbial Observatory (FeMO) project is to understand who the important iron-oxidizing bacteria in the environment are, how fast they form iron-oxide deposits, how they do it biochemically, and how they affect ocean chemistry and ecosystem function. Our team selected the Loihi Seamount because it affords the maximal cross-section of diverse habitats over a minimal spatial scale, from low-flow, low-temperature environments to high-flow, high-temperature environments, including basaltic rock habitats.